Seattle Symphony holding it down in Benaroya Hall. 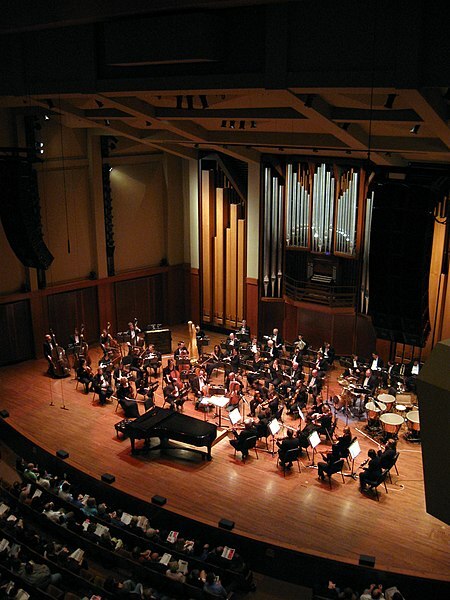 The Seattle Symphony announced this week that it’s starting an in-house record label. They’ll start pressing the group’s recordings and selling them both as downloadable tracks and CDs. (Naxos will distribute them.) I sent a few questions about the venture over to Seattle Symphony press person, Katharine Boone. Do you have plans to start a subscription music-streaming service as well, sort of like an in-house Spotify? Do you anticipate digital sales will outpace CD sales? Maybe eventually. Downloads are very important, but classical is the area of music sales where migration from CD to downloads has been the slowest. CD is still alive and well for classical, but of course it’s changing as every year goes by. How quick will the turnaround be? For example, if the Symphony performs a Beethoven symphony on a Tuesday night, is it possible you’ll sell it online Thursday or Friday? No, their plans are to release 4-5 CDs per year, and distributed by Naxos using their usual channels. However, they do have the flexibility to be able to say “hey, that was an amazing performance, let’s release it,” and get it to market within a very few months. Do you have plans to distribute music online for free? No, these recordings are offered for sale either as physical CDs or downloads.